You could win the ultimate Australian Open 2019 Finals experience including tickets for two to the Men’s and Women’s Final valued at $5,306. 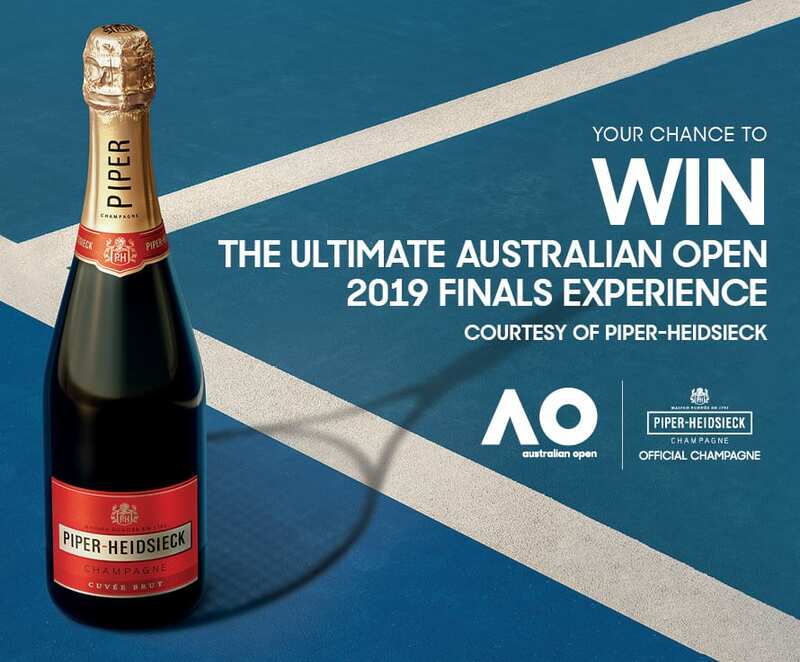 Share any two flutes or a bottle of Piper-Heidsieck Brut NV or Piper-Heidsieck Essentiel Cuvée from participating venues and receive your scratch cards for your chance to win a limited edition Piper-Heidsieck bottle and enter the major prize draw. Conditions apply. Click here for full terms and conditions. Image is for illustration purposes only. Whiteman Street, Southbank VIC 3006 (Crown). 3. Participation in this Competition constitutes an acceptance of these Terms and Conditions. 11.59am Wednesday 23 January 2019, subject to clause 7.a) (Competition Period). subject to participating venues’ individual trading hours (Participating Venues). card(s) into a Participating Venue’s entry box to enter the Major Prize Draw. d) Six (6) scratch cards per bottle (to share) of Piper Heidsieck Essential Cuvee. products purchased at a Participating Venue. method of entry will be accepted. 11. There will be a total of two thousand (2,930) scratch cards made available to Participants. Scratch cards are available while stocks last during the Competition Period. for the Major Prize Draw. 15. All scratch cards received will be the responsibility of the Participant to redeem. available to be won as Instant Win Prizes for this Competition (Instant Win Prizes). 17. Total value of Instant Win Prizes for this Competition is $2,400.00. that Instant Win Prize will be deemed forfeited. public place, including within the Crown Entertainment Complex. Marketing Offices at Crown (Major Prize Draw). Draw barrel and declared the Major Prize Draw winner of the Competition. 22. Illegible or incomplete entries will be discarded and an immediate re-draw will occur. the Major Prize will be deemed forfeited. how to claim their prize (including arrival times). for cash, or any other prize, goods or services. Prize description in clause 25 are the sole responsibility of the prize winner. published that day for twenty-eight (28) days. 31. The total value of all prizes for this Competition is $7,706.00. redeemable for cash, or other goods and services. fraud or ineligibility under these Terms and Conditions. as is practicable after the delay has been resolved. instead award the winner a similar prize of equivalent value (as determined by Crown). unless such disclosure is required by law. received at the time of cancellation, if appropriate to do so in the circumstances. collection of a prize by a prize winner).